The scepter of a wizard with demigod-like powers [and a delightful lemon-y flavor]. Madeleines are a sort of french sponge cake with a characteristic shell shape. This shape looks conveniently like the jeweled part of an Aghanim's Scepter, the spell upgrading item from Dota 2. 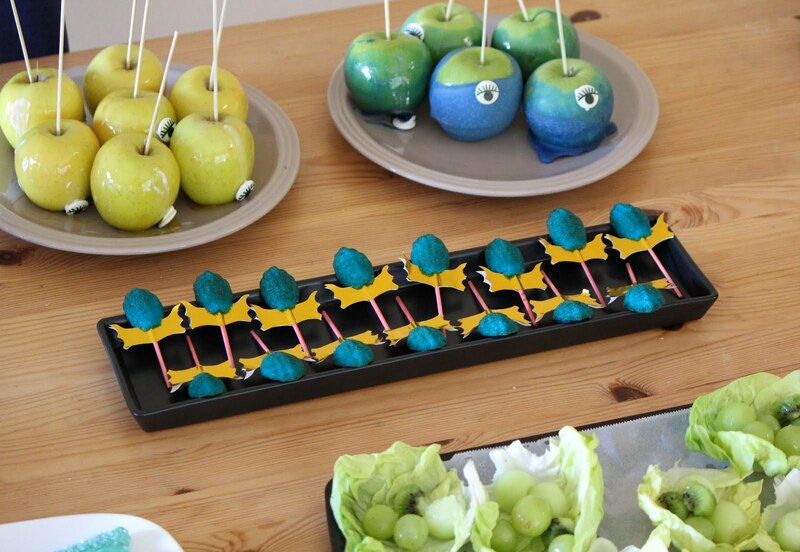 With a few crafty additions, they make adorable little Aghanim's Scepters for a Dota 2 eSports Viewing Party. I tried to dub them "Aghaleines" but the name didn't catch on. A decent Alchemist should set aside an hour to farm these up. Silicon brush for coating the madeleine tray in butter, or a paper towel and a desire to get your fingers buttery. 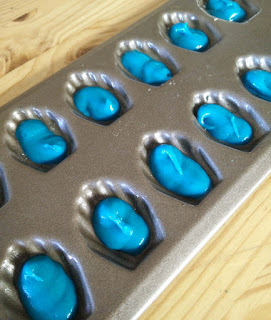 I was concerned that I would need to add too much water-based food dye to the dough and would throw off the moisture balance, so I used gel-based food dye. 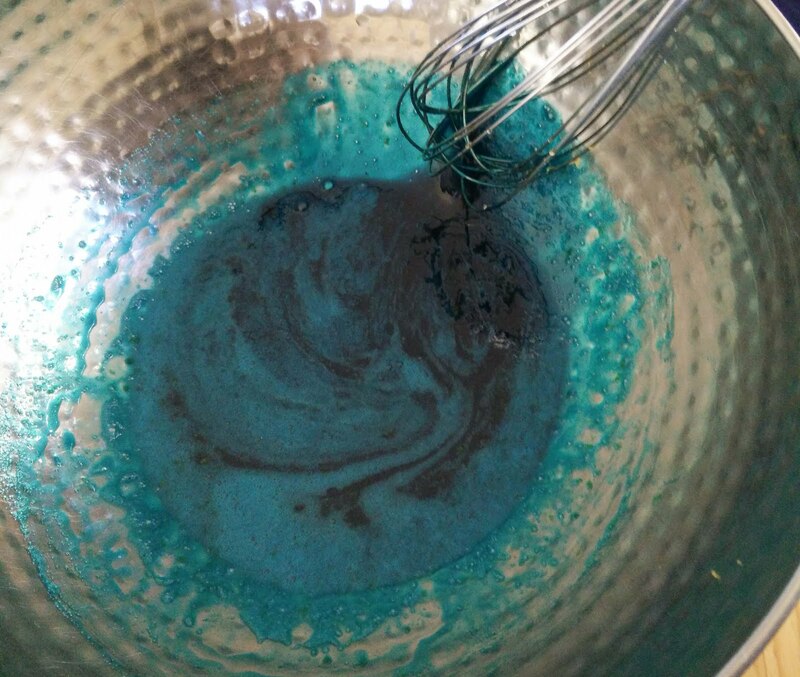 Oil-based food dye should also work, but consider mixing it in with the butter instead of with the eggs. 1. Microwave the 130 g of butter until fully melted, then skim off 10 g (~1 tbsp) of foam to partially clarify the butter. 2. Sieve the flour and the baking powder into a bowl. 3. In a second bowl, mix together the eggs, lemon zest, vanilla, salt, honey and sugar. The goal isn't to fluff anything up, just to combine it. 4. Add in the food coloring. I think I ended up using around 1/4 tsp (which is a lot! ), but start slowly. It's much easier to make something more blue than it is to make something less blue. My final color before adding the butter and flour. 5. In three batches, fold in the flour mixture, then pour in the butter and stir to combine. 6. Fit the piping nozzle into one corner of your ziploc bag. Pour in the madeleine batter. Except don't be like me and forget to put in the nozzle first. 7. Refrigerate for 10-15 minutes to make it easier to pipe. Meanwhile, preheat the oven to 340F. 8. When you are ready to bake, melt the remaining 1-2 tbsp of butter. Brush the butter generously into the madeleine tray. This is the approximate volume to aim for. 11. When the tops of the cookies feel sponge-y and not sticky/dough-y, pull them out of the oven. Hold the mold on its side and tap it against a clean kitchen towel-lined surface. The madeleines should drop out of their own accord. You may need to give one or two of the stragglers a gentle nudge. I only had the patience to make ~20 full scepters. The blue madeleines are perfectly lovely on their own as well. Scale the number of kabob sticks and paper cut-outs as desired. These are a little time consuming - but it was something to do while watching DC climb through the loser's bracket! 1. Using pliers, cut wooden kabob sticks into roughly 2.5-inch pieces. 2. Put these into a food-dye resistant container, and add just enough water to cover. 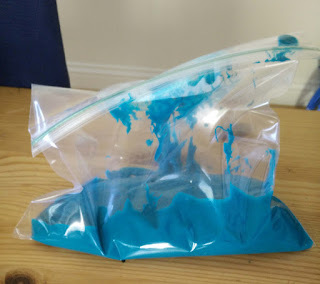 Add 4-5 drops of yellow water-based food dye and 3-4 drops of red water-based food dye. Swirl to mix the water and dye. You're aiming for a darker liquid color than your desired end stick goal. Let stand for 5-6 hours, or until the sticks are the desired shade of orange. Drain, and dry on a paper towel. 3. Make a stencil for the golden Aghanim's Scepter fixture out of card (ex: recycled cereal box). Try to get it as symmetrical as possible. I made mine 2.5 inches in width, and 0.75 inches in the middle. Trace onto golden origami paper. Make enough for two for each scepter. You can cut down the amount of cutting you need to do by cutting 4-5 sheets at a time. 4. 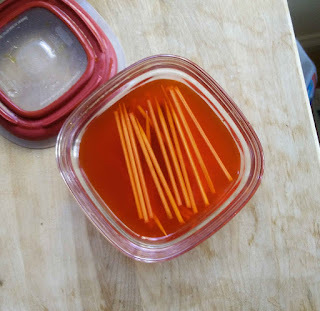 Using double sided sticky tape, fasten two papers on either side of a dry dyed kabob stick. Leave about half an inch of stick above the paper for attaching the madeleines. 5. With a paring knife, cut a small slit into the base of each madeleine. Spear each madeleine on a stick, sliding the paper a little into the cake. 6. Arrange on a plate and serve with your other favorite Dota 2 snacks! The madeleines are really tasty - it's so easy to eat so many of them. They look adorable completed into scepters, but this is definitely a project for those who enjoy crafting! If you're looking for a Dota 2 dessert that looks really impressive and can be put together in 15 minutes (instead of the 2+ hrs these scepters took me! ), I recommend chocolate-coated pretzel magic sticks instead. I'd love to see your creations, if you try this! Nerd To Table - an excellent compendium of nerdy recipes.